It’s been a busy weekend (and week for that matter). But, then again, it always is. 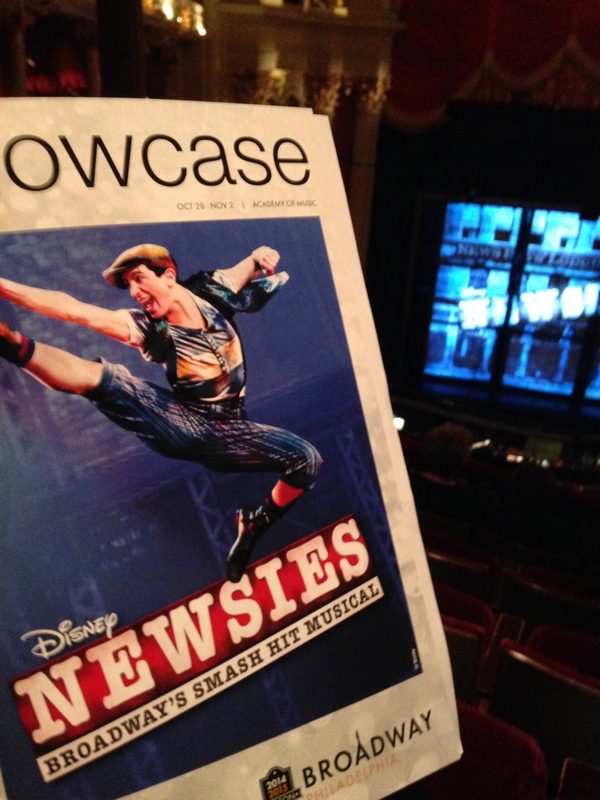 Friday night, Erik and I went to Philly to see Newsies. I absolutely love musicals and have wanted to see Newsies for quite a while. I missed it on Broadway, but I’m glad the tour officially opened in Philly and I got to see it. Loved it. So worth the ticket price even though I can’t really afford to spend right now (which of course has me spending money). If you have a chance to see Newsies, DO IT! Jumping away from the weekend to Thursday, I worked Thursday night which left me time to ride Thursday morning. It was a nice day too which helped. Because Erik already left for work, I decided to ride Batt. He’s reliable and I try no to ride Subi when no one is home. Batt is safe Safe SAFE and at least I know he won’t spook whereas Subi… Nonetheless, it wasn’t a fun ride. I got on Batt who was in a mood and decided to do my 2 point in the round pen. Batt wasn’t feeling it at all. He didn’t feel lame a the walk, but didn’t want to move forward. We fought, a lot, all in 2 point. I asked for a forward pace he cantered. I woahed him back, we halted. Lots of fights. I eventually gave in and decided just to deal with the terrible pace until I got out of 2 point. 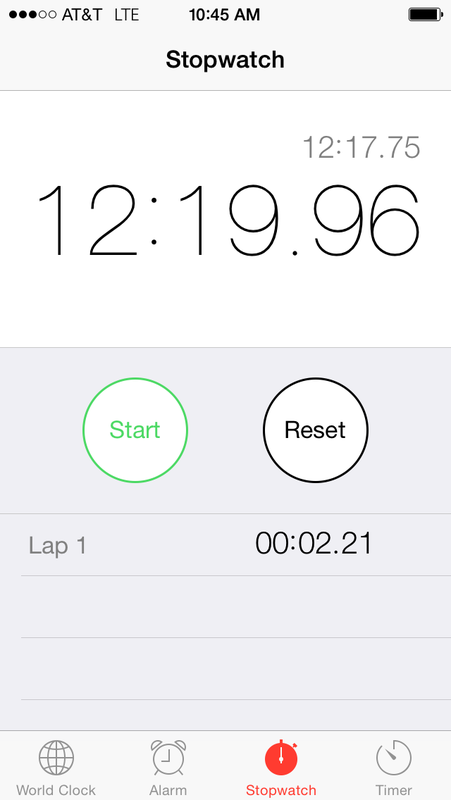 I survived for 12:18.96. I’m sure I’d have made it longer if I wasn’t fighting my horses, but it got to the point that I could deal any more with leg hold crop crap and my calves and back were killing me and I sat down. But I made my original goal of 10 minutes. After 2 point hell, I decided to leave the round pen. Grumpy however was being stupid, again, and didn’t want to stand while I undid the gate chain. More fighting until he realized we were going to leave and stood… That horse. I thought a trot up the hill would cheer him up (strange horse loves hills, especially galloping up them). Unfortunately, he didn’t feel right at the trot. Not lame necessarily, but weird so I walked after a couple strides. Batt was looking longingly at the development across the street so despite the off feel, we went for a short walk which he enjoyed. But his slow pace was just off. I decided to trot again and immediately could tell he was off on his right hind so we walked home (since he seemed ok a the walk). He had some heat in the hoof and based on how he was standing, I was fairly sure an abscess was brewing. He was way gimpier Saturday and I’m sure my diagnosis was right. 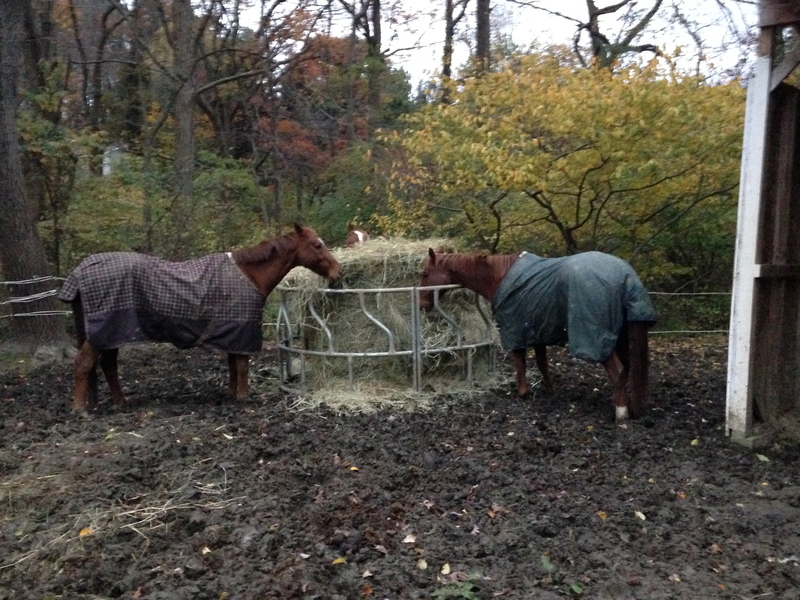 He’s doing his abscess stand/walk and is otherwise happy and no heat in the leg… Hope it blows soon! Moving ahead to Saturday, it was rainy and miserable. Based on the pending weather, I threw sheets on everyone Friday night. Of course, Saturday morning, Batt had some tears in his hastily repaired sheet so I repair my only other sheet and threw that on Saturday night (Saturday morning duck tape didn’t stick with the rain). Erik and I threw out a round bale first thing in the morning in the dark at 6:30am. Batt parked himself in front of it after breakfast and didn’t move until dinner while Subi and Hayley sulked about the rain, cold, and wind…. Due to the rain, I didn’t teach. I had a lot to do and instead spend most of the day on the sofa with my puppies. They loved it! (I did too). This morning I went out early to teach. Horses were good despite the cold and crazy wind. After a quick trip to my mom’s to pick up her supplied alfalfa cubes and beet pulp (and a quick visit with her puppies), I had a 2 person trail ride. Really nice pair and despite the wind, they had a nice time. I took Peyton out instead of Heidi and it was nice just to be riding something dead quiet. He was a good boy. Unfortunately, my right hip kept cramping up during the ride and it’s still bothering me a bit. I did realize how easy short bursts of 2 point are though! I guess all of this 2 pointing has paid off! Now I’m home and it’s dark outside. I really need to start dinner, but the sofa, quilt, and dogs are so much better! This entry was tagged 2 point, 2pointober, abscesses, Batts. Bookmark the permalink. congrats on the awesome 2point time! sounds like a mostly productive and relaxing weekend!